Skandinavisk frihet is a body of the right-wing organization Skandinaviska Förbundet in Sweden, founded in February 2018. The volunteer being presented as a Norwegian said that the sub-unit named “Scandinavian” had been receiving orders from the Russian Armed Forces and had been included in the operational structure of pro-government forces operating in Syria. The interviewee described the sub-unit as a section of a mounted infantry, which had possessed the access to battle tanks and heavy weaponry. The main goals were the collecting of surveillance information, exploration of enemy’s deployment and number of ISIS’ forces. Most of the members were from Scandinavian countries: Norway, Sweden, and Iceland. According to the volunteer, the Scandinavian sub-unit also received Russia’s artillery support during actions against ISIS. 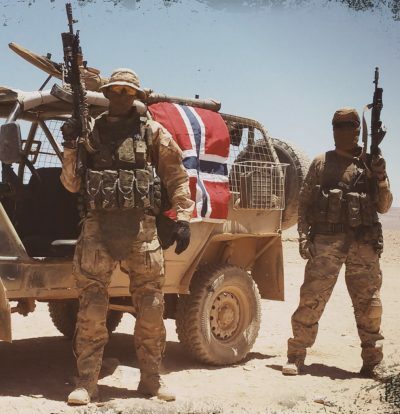 On May 11, Norwegian media outlet AldriMer.no published an article “Norwegians combatted in Syria on the Russian side” quoting the interview of Skandinavisk frihet site. According to AldriMer.no, the Norwegian Police Security Service (PST) replied that the Norway citizens’ participation in the foreign military actions could be under Criminal Rule. AldriMer.no analyzed the photos featuring Norwegian and Scandinavian soldiers published by Skandinavisk frihet. The results showed that some of those photos had been taken in April and May of 2017, proving the soldier’s allegations. However, other photos were clear from metadata. All images in this article are from Skandinavisk.